I was taking this race pretty seriously, and had an easy week in preparation for the 12km. The course was predominantly on very even grass, with quite a few changes of direction and short climbs ans descents, but nothing too steep - promising to be a very fast course. I started on the front row and made a good start (very important in a race with 1500 people in it). I was probably around 70th, and felt fairly comfortable. Rob Baker (also GB team) was running just in front of me, and it stayed about the same until the second lap. Then on the hillier section of the course, about half way into the race, I started getting sharp pains in my mid-back. I used to have some back problems as an M20, with similar feelings, but before the race I had been fine for several years. After about 2 minutes of running through the pain I decided to drop out of the race, it was just too painful. Jogging back to the tent I felt fine again, and my back was fine for the rest of the day. I was pretty gutted, as I had in my mind that I was going to get a really good result. I was frustrated not only that my body had let me down, but also that I couldn't make myself run through the pain, and even finish the course. After the xc, I drove across to the Lake District for the second National event of the year, and also a World Ranking Event (and so there were a few more elite runners that at the first one). On a brand new area there was quite a lot of excitement about the race - it had been postponed from the year before because of bad weather. The men's elite classic race was only 9.2km, so we were expecting a VERY tough forest to meet the 75 min winning time, and it was obvious from some of the early runners times that it was going to be stupidly quick. In the end I ran 57 mins to Oli Johnson's 56. The forest was very rocky and pretty tough both technically and physically, but the courses were planned in such a way that there were a lot of path options, and lots of ways to make the navigation simple. 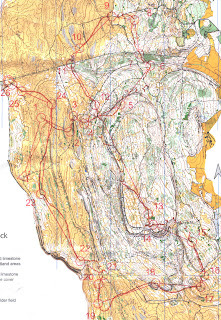 There was also a significant part of the course (maybe 50%) in the open fell, which although rocky was technically very easy and very fast running (although you had to watch where you were putting your feet). 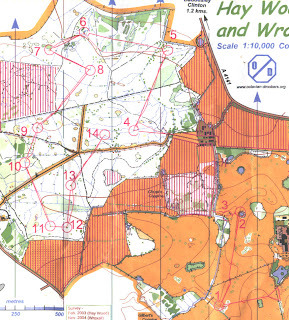 Of the 26 controls, 6 were on crossing points, 11 were in the open fell, and at least 6 controls you could see from 50 metres away on the approach to the control. So to sum up, it was ok, I enjoyed the race, and it was a really good area, but the race should have been a lot longer, and could have been amazing. There was plenty of room on the area for a much longer course, and considering it was a world ranking event, with an IOF controller, I think it is pathetic that the winning time was 19 minutes out (25 % !!!!). The women's race was simlilarly short, as were a lot of the other classes. My back felt fine warming up, and even during the race. It was only in the car on the way home that my back felt really sore again. It is important to relax and get away from the serious side of running and training occasionally, and on Monday night I ran the tri-annual Warwick University Pub Jog. A running club tradition for the last 19 years (although now pretty much dominated by orienteers), the concept is simple - run a 10km loop starting and ending at the university, taking in 10 pubs and a fish and chip shop, and end in the Students Union with the more committed runners have a pint in every pub. That pub jog was my 10th (I think), although I am someway short of the record of 53ish set by one of the university lecturers and former students. Last year the GB squad introduced a 5km terrain time trial as a part of the selection process, and also a personal bench mark for us to compare our fitness level against twice a year. We ran it for the first time last April (the day after the British Classic and Relay champs). Results here. We ran it again in November (although I didn't run it then). Results here. We ran it for the third time on Saturday, and I was 11 seconds quicker than I year ago. There are several reasons I ran faster, firstly last year I had raced the two days before. Secondly, I have had a good winters training and I am in good shape. I had some back problems again from about 2km into the trial, and it was difficult for me to not quit the race. I managed to keep going though, although I am certain that I was definitely slower with my back hurting than I could have been otherwise. So I am satisfied with the improvement, but I know I am in better shape than my time shows anyway. There were not a lot of guys there this time, but guest runner Mats Haldin showed us all the way destroying the British guys times. Results here. Yesterday was the first round of the 2007 CompassSport Cup, the premier club competition in GB. As holders, the pressure was on OD to make it through the qualifying round, despite the fact that we were missing at least 5 runners on England duty and several others absent for other reasons. 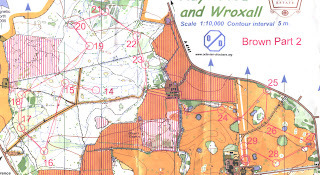 We were hosting the race, in Hay Wood and Wroxall Abbey. It is always strange to race in a forest you have trained in so much, and at times it did feel like, 'ok I'm running to the pit with the bent tree beside it' or 'that ditch bend by the holly bush'. But then again, it is easy to get complacent and over-confident in those situations, especially in what is a tricky forest in places. Well anyway, I won my race by a long way, and OD won the competition comfortably. 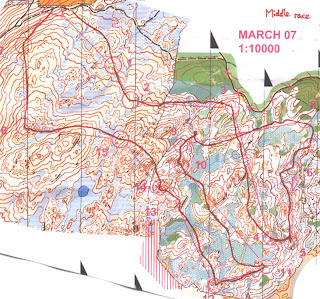 Last time I raced in this forest in 2005 I ran 8.6km in 43.55 (5:06/km). This time I did a bit better, running 9.6km in 43.21 (4:31/km). I made one small mistake (maybe 10 seconds), and I won 24 of the 30 split times. Most of the GB squad assembled in Hawkshead for our traditional spring technique weekend in the Lake District. Some people trained on friday as well, but I arrived late so my first session was on saturday morning. Working on whatever technique we felt needed improvement, we had 2 loops of roughly 4km with a line section and a normal course section on each. In the afternoon we had a middle race on Bethecar Moor and Forest X. Starting in the open moorland, after 2 controls we dived into the highly detailed and very cool Forest X for quite a long part of the course. The last 3 controls and finish were back out in the open. I had a pretty good beginning and end to my race, but I was a bit sloppy on a few controls in the forest in the middle part, and I was lucky to win as Scott made a big mistake at the end. Sunday we were up on High Dam, with a fairly long course with lots of controls. 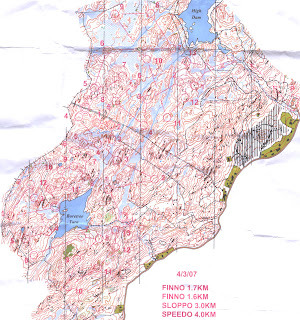 The course was split into 4 sections, 2 short control picks, then some slope orienteering, and then a 4km course to finish. Again we were working on skills of our choice. The first two sections I was working on control flow and visualisation, the third, I tried to simplify and just pick out the key features, and the last section I just ran as a course (although I started to get tired and lose concentration at the end).